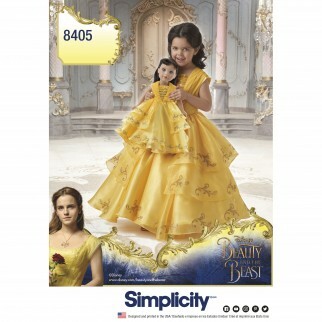 Disney Beauty and the Beast Live action child and doll gowns. Relive the beautiful tale of Beauty and the Beast with this childs live action Belle costume and matching costume for her 18inch doll. Gorgeous gowns can be made in the traditional yellow satin. Full overskirt has three layers of ruffles, each detailed with perfectly placed glitter embellishments. Bodice overlay layered over collar and front ruffle for a delicate look. Gown has invisible zipper in the back. Authentic Disney Beauty and the Beast Dress for Simplicity.